Even though not a motorcycle-specific product, Datel's self-powered, LED voltmeter line is very popular with motorcyclists. I bought mine at Digital Meter for about $50. 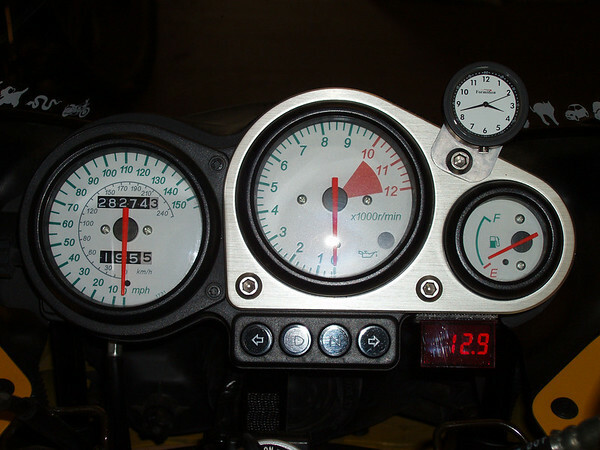 Digital Meter's site has a lot of very useful information, including links to websites showing Datel meters installed on various motorcycles. I opted for the DMS-20PC-1-DCM model, with a red LED display within a 8V to 50V range and .1V resolution (I figured the .01 resolution would flicker around too much). The unit is roughly 1.4" long by .9" tall by 1" deep and only weights a few ounces. The case is polycarbonate and the "guts" are epoxy-encapsulated, which should make the unit practically waterproof, although Datel doesn't market it as such. A panel-mount retaining clip is included and a plastic bezel is available for a few bucks for an almost factory panel mount look. I opted to mount mine to the underside of my gauge cluster using 3M Dual-Loc (sort of a "Super Velcro"). With only two wires, hook-up is as simple or complicated as you'd like. I chose to run the pos and neg wires directly to the battery instead of splicing into a switched circuit. With a max current draw of only 13mA, I'd have to let my bike sit for weeks before it would drain the battery appreciably, and it's a 2-minute job to disconnect if necessary. Plus, hooked direct to the battery I get a true reading and I can read voltage even with the ignition switched off. I've subjected the Datel to many miles of poorly-maintained Pennsylvania backroads, and lately, a lot of rain. The Datel hasn't shown even a momentary glitch. My only caution is that the display lens is soft; I scratched it a bit swiping some pollen off with a gloved thumb. I recommend some protection such as vinyl cling material (BTW, tinted vinyl could also be used to dim the bright display if desired; mine is below usual eye-level so it isn't a problem). It's too early to determine long-term reliability, but Datel meters have an excellent reputation among Internet motorcycle forum members. I give the Datel a solid recommendation.